Kabul, Afghanistan – Afghanistan‘s electoral commission said it was extending voting in the country’s parliamentary election to Sunday after several polling stations failed to open. The extension was due to lack of voter materials at some polling stations or problems with the electronic voter system, the Independent Election Commission (IEC) said on Saturday. Polling stations across the country were supposed to open at 7am (02:30 GMT) and close at 4pm (12:30 GMT). “The polling centres that opened later than 7am will remain open until 8pm. The polling sites that remained closed until 1pm, will be opened tomorrow and people can cast their vote tomorrow. No one’s vote will be wasted,” Abdul Badi Sayad, the electoral commission chief, told a press conference in Kabul. Sayad also said the late arrival of electoral staff at some polling stations added to the delay in voters casting their ballots. Afghans who had queued since the morning were disappointed. In Kabul’s Dasht-e-Barchi area, at least three polling centres did not open their doors to voters. “There was a huge amount of people waiting to vote. The polling station was closed. I could not vote so I left.” Muqaraba Meerkhel, a 53-year-old teacher, told Al Jazeera. 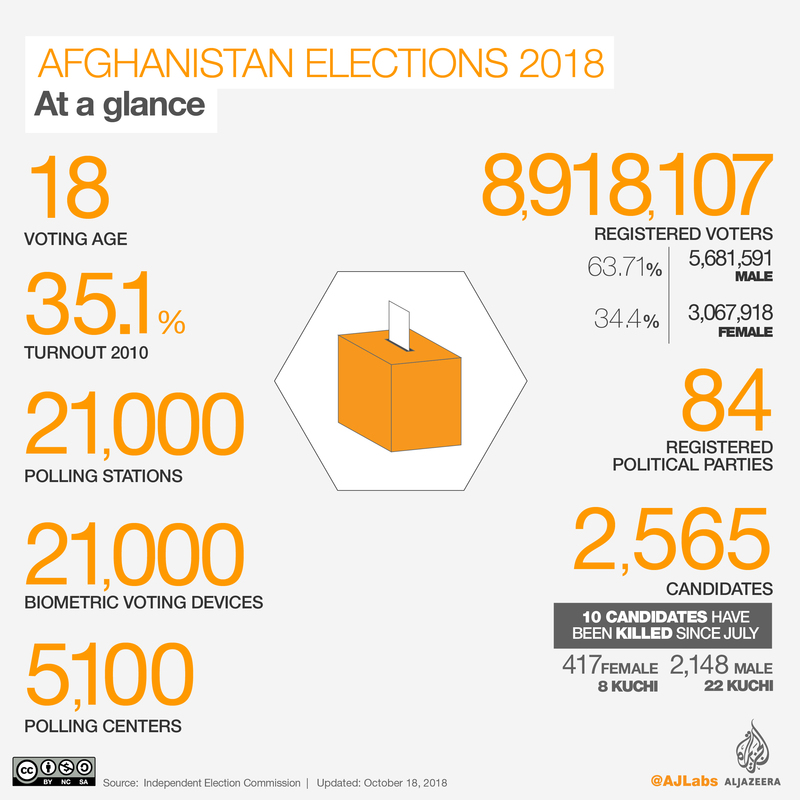 “More than 25 percent of the centres we observed were not opened,” Naeem Ayubzada, director of Transparent Election Foundation of Afghanistan (TEFA), told Al Jazeera. “We also observed technical challenges with 32 percent of the biometric systems not working in 22 percent of the polling centres. Also, nine percent of the centres were not equipped with the biometric system,” he said. Zabi Ullah Sadat, deputy spokesman for the electoral commission, told Al Jazeera a total of 244 polling centres did not open. There are 21,000 voting stations in 5,100 polling centres across the country’s 33 participating provinces. The election was delayed by a week in the southern province of Kandahar following the killing on Thursday of the powerful police chief, General Abdul Raziq, in an attack claimed by the Taliban. 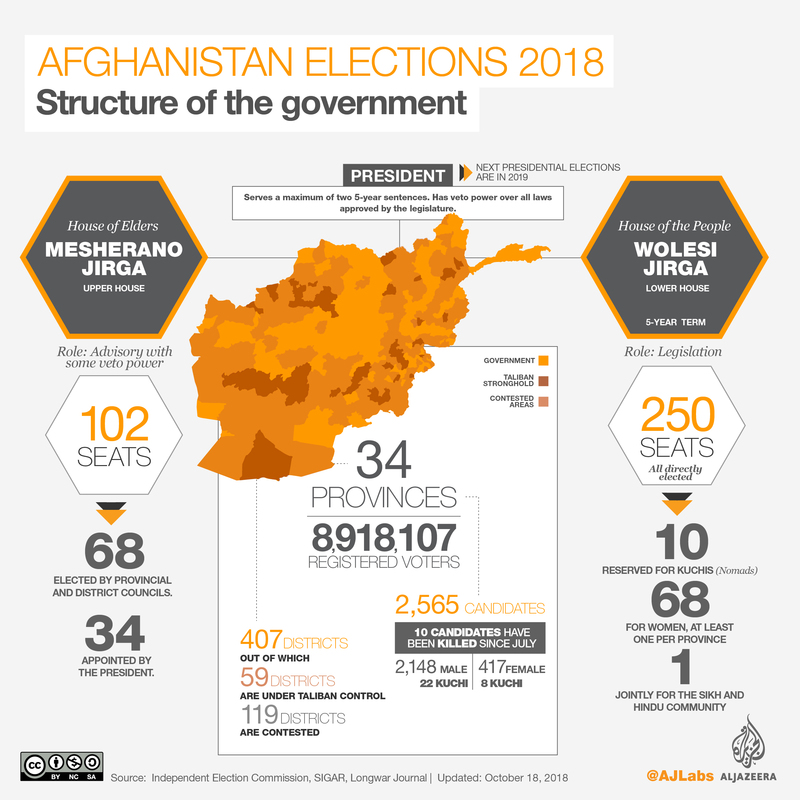 Voting will also not take place in Ghazni because of the precarious security situation – the Taliban controls significant parts of the province. There is also an ongoing dispute over how to divide Ghazni’s electoral constituencies to have a more balanced ethnic representation. Meanwhile, several polling stations across the country were targeted by explosions. In Kabul’s PD15 district, an IED explosion killed one police officer and injured a civilian and a policeman, a spokesman for the city’s police chief told Al Jazeera. In Kunar province, two women were killed as they were heading to a polling station in Manogi district, said Aziz Ulrahman Sapay, a health official. Two other people were also killed in Kunduz province, a security source told Al Jazeera. Two rockets hit near Lashkargah airport in southern Helmand province, Omar Zwak spokesperson for Helmand provincial governor. No casualties were reported. Security has been a major issue in the run-up to voting day. Since late September, when campaigning officially started, at least 10 candidates have killed and two others abducted. Ballot counting will begin when voting ends, under the watch of election observers. The electoral commission has not set a timeline for announcing official results, but preliminary results are expected within a month. US midterm elections: What are the key issues?